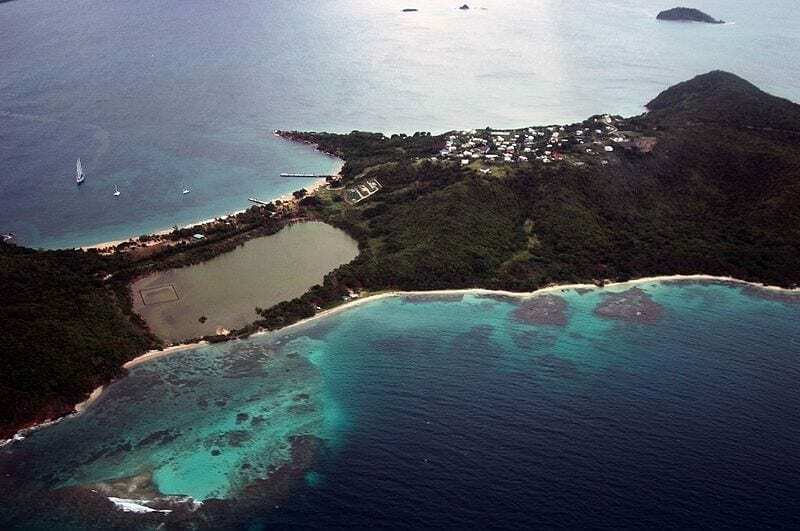 The smallest of the Grenadines, the southern Caribbean island of Mayreau is being split in two as sea level rises with a rapidly warming climate. The story is the same for island nations and territories worldwide. Odds are that residents eventually will have to evacuate and find new homes elsewhere, raising prospects of mass migration and conflict. Confounding efforts to phase out the use of fossil fuels to stem the rising tide of human greenhouse gas emissions, oil and natural gas will provide more than half the world’s energy needs come 2040, according to the recently released, 2018 BP Energy Outlook. That would assure the UN community of nations fails to realize the goals set out in the UN Paris Climate Agreement. Oil and gas corporations are well aware of the growing risks climate change mitigation policies and actions — fossil fuel divestment particularly notable among them — pose for their organizations and shareholders. They continue to invest to expand their activities and operations, however. 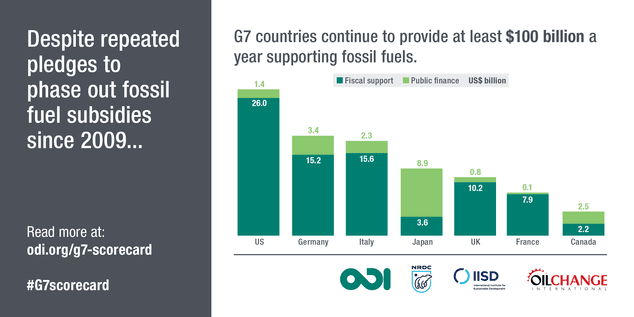 G7 countries continue to subsidize fossil fuels production and use despite government commitments to phase them out. National governments subsidized fossil fuels to the tune of at least USD81 billion a year in fiscal support and USD20 billion per year in public finance on average in 2015 and 2016, according to a June 2018 study produced by the Overseas Development Institute, Oil Change International, Natural Resources Defense Council, and Global Subsidies Initiative. The US ranks at the top of the list among G7 nations. The world’s leading international development banks continue to fund massive fossil fuel projects despite commitments to phase out financing of “dirty” energy and the leading role they have taken on to help realize the goals of the UN Paris Climate Agreement. One of the world’s most densely populated, less industrialized regions, Southeast and South Asia abounds in untapped, emissions-free, renewable energy resources. Vested economic and political fossil fuel interests continue to thwart efforts to capitalize on these, however. The Asian Development Bank no longer funds “dirty energy.” However, it continues to fund fossil fuel projects, including coal-fired power plants. That has lead “watchdogs to question whether there is a disconnect between its policies and commitments to help address climate change,” a recent report highlights. According to the latest, global study from the UN Intergovernmental Panel on Climate Change (IPCC), humanity has just 12 years to drastically reduce greenhouse gas emissions and keep the rise in mean global temperatures below the 1.5°C (2.7°F) – 2°C (3.6°F) climate change tipping point determined by UN Framework Convention on Climate Change (UNFCCC) scientists. “[U]rgent and unprecedented changes are needed to reach the target, which is affordable and feasible although it lies at the most ambitious end of the Paris agreement pledge to keep temperatures between 1.5C and 2C ,” the IPCC report authors stated according to a report from The Guardian. Those urgent and unprecedented changes won’t happen, at least from now to 2040, according to BP. Global renewable energy capacity will increase more than 400% and account for more than 50% of the total increase in energy production out to 2040, according to the BP Energy Outlook 2018, which BP Group Head Economist William Zimmern presented at a recent World Energy Council congregation in Ankara, Turkey. 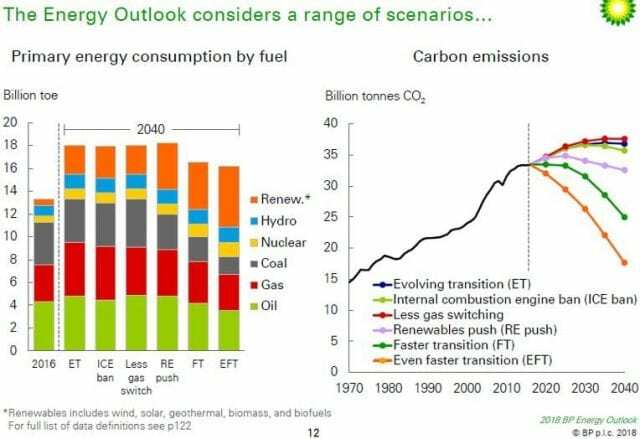 Nonetheless, BP’s analysts forecast that oil and natural gas will constitute more than half worldwide energy production come 2040. 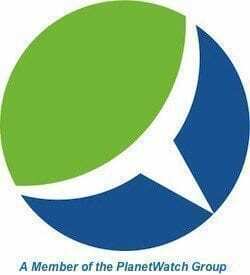 They also forecast that carbon emission levels will increase 10 percent over the period due to increased energy demand and consumption. That’s despite a forecast that use of electric vehicles will increase substantially — reaching a 15 percent global market share. Demand and production of electrical energy will account for 70 percent of the total increase in energy demand, according to the BP report.